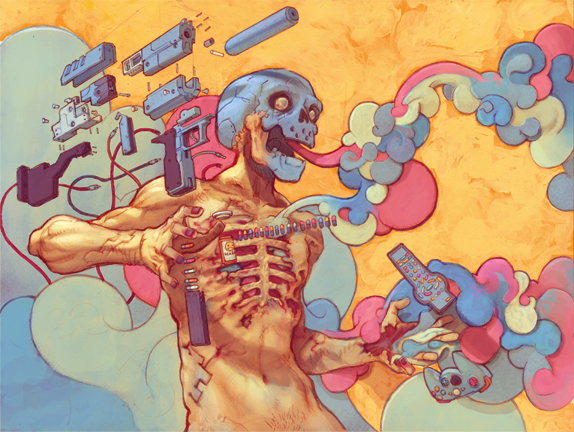 Deseo is an artist based in Kansas City, Missouri. 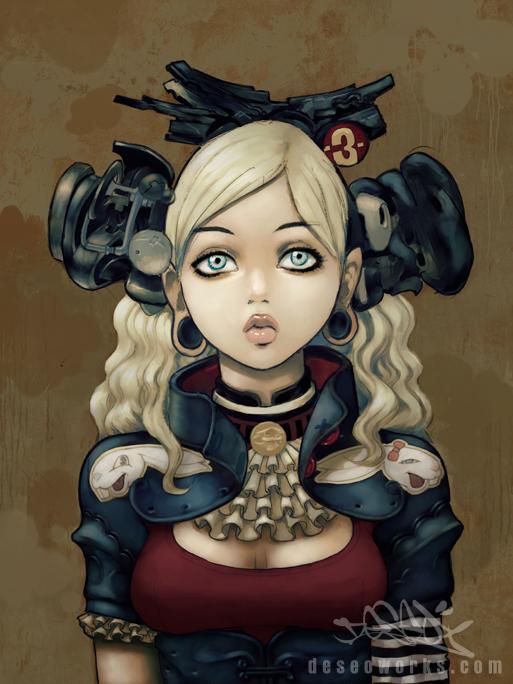 His style is inspired by a diversity of influences ranging from Japanese manga, classic art, pin up, graffiti, the adoration of the female form, and many other artistic styles. I had a little message exchange and I asked him about the process he usually follow to do one of his amazing pin-ups. Deseo è un illustratore di Kansas City, Missouri. Il suo stile si ispira ad una molteplicità di influence che vanno dai manga all’arte classica alle pin-up ai graffiti. Ho avuto uno scambio di messaggi con lui ed ho così potuto chiedergli quale processo di lavoro segue per la creazione di una delle sue pin-up. 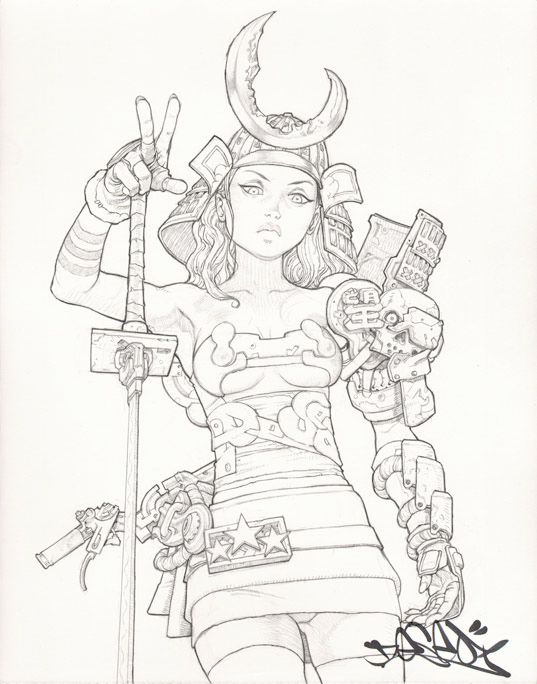 “Before starting any sort of drawing intended for coloring, I sketch out some loose concepts. for this piece I knew I wanted to draw a character with a punk rock style outfit, some tattoos and a red mask. The figures that I draw out give me an idea of what shots will be good for the face of the character as well as the overall balance of the pose and pieces of her outfit. I also experiment a bit with the sort of mask. At first, I was really attatched to the idea of have a full face mask, but when actually drawing it out, I thought that it might make the character appear somewhat lifeless. So I played a bit with cropping out different portions of the mask. Having these things sorted out helps me get done with the final drawing quicker, because it also gives the character a more personality before I get started on the final drawing. For the final drawing I use a smooth surface 11×14” piece of drawing paper. I like drawing out details, some of which aren’t always clearly visible on internet net posts. But none the less, you get a pretty clear idea of their presence. Once the pencil drawing is complete, I scan it, bring into photoshop for coloring. Before coloring, I’ve already got a rough idea of what the color scheme will be. I create a sublayer of flat colors that will set the mood for colors, but more importantly, will be used to quickly select areas and idividually color. From here on anything goes. what colors I use and what lighting I decide to stick with, can change the entire piece. In the end, I wanted to go with a somewhat dark theme, and therefore kept the main source of light near the top center of the character.. the final product… My newest piece entitled “Game Over”. I just want to mention I am newbie to blogging and site-building and honestly liked your web-site. Probably I’m want to bookmark your website . You really have great posts. Cheers for sharing with us your blog site. I am looking both for blog sites that offer honest, balanced commentary on all issues or blog sites that have a liberal or left-wing angle. Thank you.